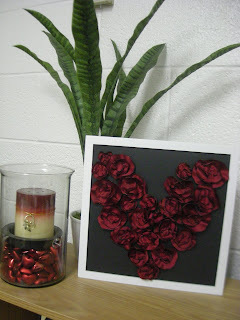 This is a simple project I came up with for Valentine's Day that I really like. All it took was fabric, candles, paper, and hot glue. And, I guess, a frame in which to display the finished product. I hope you like it! 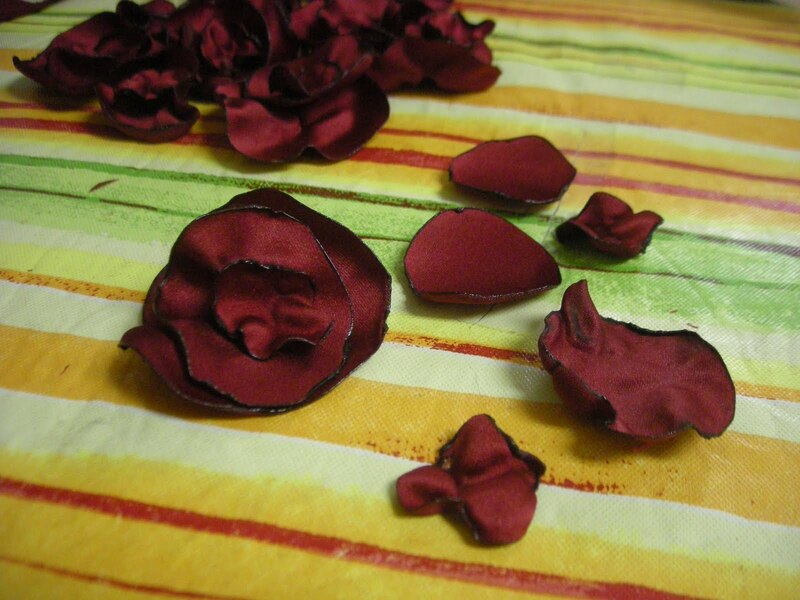 First, make your flowers. I'd never done this before. I'm quite nervous around fire too, but it wasn't bad at all. If I can do it, you can do it. b. Melt the edges over a flame. I used birthday candles held up with a clothespin. (Breaking the bank, I know.) If the circle catches fire, just blow it out. It adds character to the flower and looks pretty, so don't despair. c. Holding the circle over the flame about 1-2 inches, slightly pucker the centers of the circles if desired. Be careful, since this can cause the centers to melt into black goo or make melted holes if you hold it for too long. Trial and error. You'll get the hang of it quickly. I thought this made them look more like real flowers and less like, well, circles. 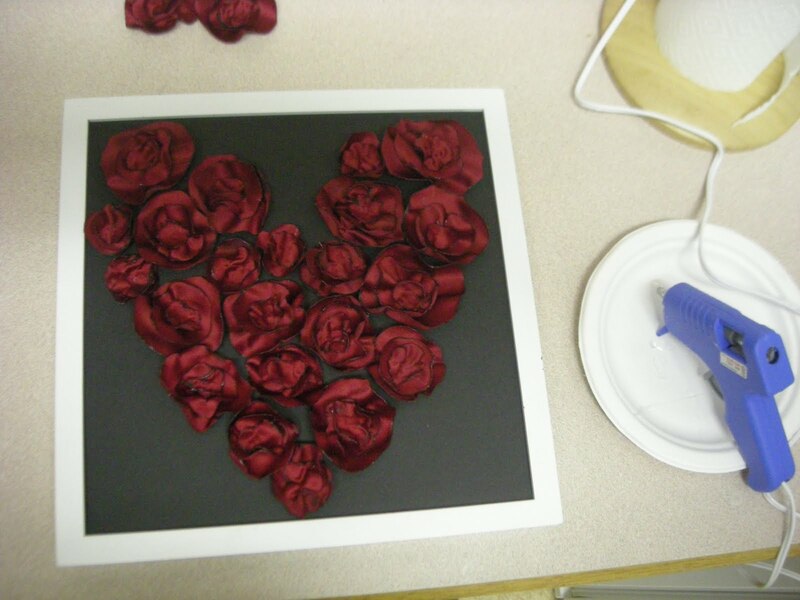 d. Form your flowers by placing your "petals" inside each other and hot gluing them together. Most of my flowers were three layers, but I made some with only two that looked pretty. You can also use thread to sew them together. I tried that, but it was taking longer than I had patience. Hot glue was faster and easier for me. 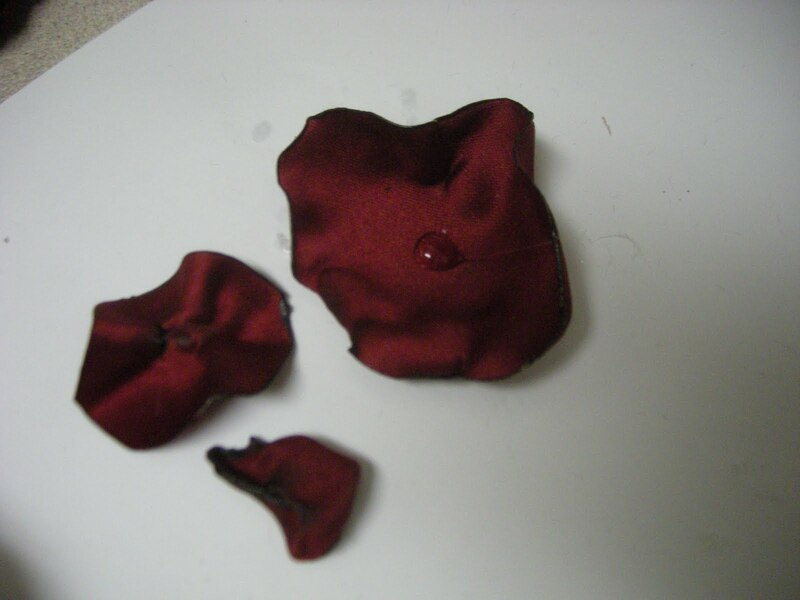 e. Optional: Glue beads or buttons in the center of your flowers. I originally planned on doing this...but decided I liked how it looked without them better. Second, place a piece of paper in your frame on which to glue your flowers. 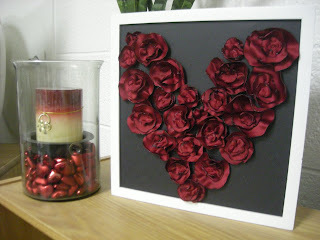 Third, place your flowers on the page in the form of a heart. Fourth, hot glue the flowers in place. Realize that as you glue your flowers in place, the shape may shift. I ended up altering my design and fiddling with it a bit after I'd glued several flowers in place. The other flowers had shifted, and it didn't look the way I wanted anymore. So make sure you have some extra flowers to help you rearrange the unglued portion if necessary. Fifth, admire your handiwork. :) This is my favorite step. Very cute Marie. I can't wait to show you some of my valentine crafts. Are you coming down anytime soon? Love this!!! So unique! Can't wait to try it! Thanks! I adore this. 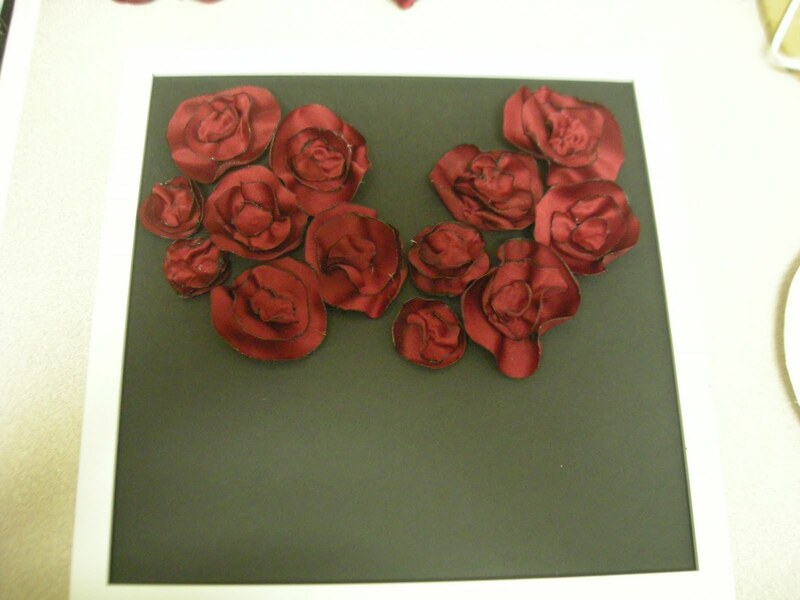 I have made hair clips out of these kind of flowers but never thought to make it into art for the wall. Great idea! This is super cute! I'm so impressed Marie. I totally need this in my house. 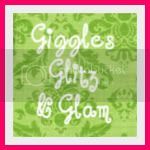 :) Love the new blog! 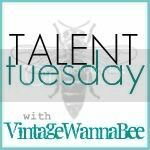 You've been featured so come check it out and grab a button!